Join all your favourite characters from the beloved tale of The Gruffalo in a race to match the most rhyming words. 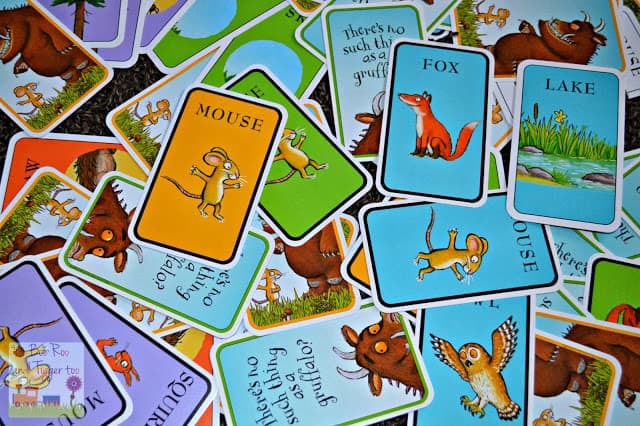 Children use their colour matching, reading and rhyming skills to play cards and win the game. It’s no secret how much Tigger loves The Gruffalo story, he knows it off by heart and can easily complete the rest of the tale no matter where you start him off. The Gruffalo DVD is regular viewing alongside The Gruffalo’s Child too. So you can imagine his excitement when we were sent The Gruffalo Word Rhyming Game to review. At first glance I wondered whether the game was a little too old for him as Tigger is only just about to turn three. The two game ideas included in the box looked too complicated for him to comprehend, so I decided to take a look at the cards included with the game to see if we could come up with our own ideas. As you get two of each rhyming card i.e. 2x eye, 2x butterfly etc. this can be made into a simple pairs game. Encouraging toddlers to recognise the picture on the card with the word on the card. This can be played in several ways; either by holding up one card at a time and getting the child to say what the picture is i.e. Squirrel, cake etc. Or for pre-school/reception aged children learning to read you could cover the picture and ask them to read the word and then reveal the picture if they are correct. A great way to encourage child to learn their colours is to get them to group things of the same colour together. 1. Remove one card from each colour i.e. blue, green, yellow etc. Hopefully they will sort the cards according to background colour although you may find a few yellow owls in the yellow card pile. Given the flexibility on the games you can play with these games I think that the £4.99 RRP is a great price (although you can often find it cheaper on Amazon etc.). Whilst it may be advertised at children 4 years+ I actually feel it is suitable from 2 years+. 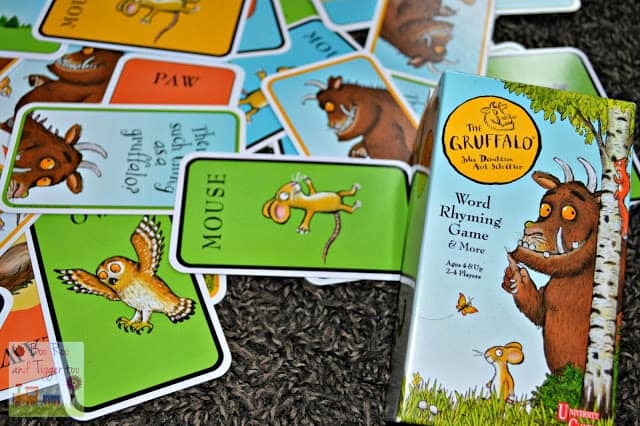 Disclosure Policy: We received The Gruffalo Word Rhyming Game & More FOC for the purpose of review.